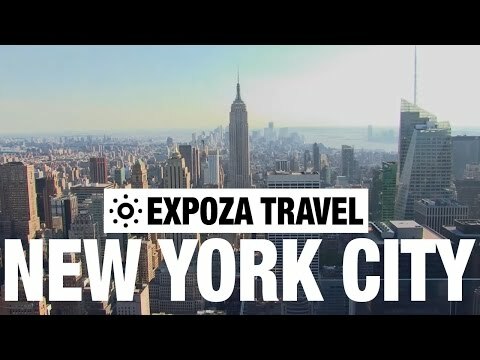 Vacation travel video about destination New York City in New York. New York continues to be one of the world’s most famous cities, a true world metropolis and major symbol of the American Dream. Manhattan Island is the city’s most well known district and the Rockefeller Center in Midtown is often referred to as the heart of the New York. Nearby the Roman Catholic Saint Patrick´s Cathedral is the largest and most magnificent church in the United States. The Grand Central Terminal divides Park Avenue and is a huge station with which the railroad kings, the Venderbilts, left an indelible mark. The huge hall, with its magnificent vaulted ceiling in Beaux Arts style, has been the city’s central railway station for twelve lines since 1913. The confines of Chinatown are inhabited by a hundred and fifty thousand Chinese from China, Taiwan and Hong Kong, most of whom are unable to speak a word of English. Chinese characters wherever one looks and restaurants and Asian stores on every street corner. The famous Wall Street was named after a wall which in the early days protected the growing city against attack by Native American Indians. However, the roots of its subsequent claim to fame were laid in 1792. The young state desperately needed investment and therefore the powers that be decided to issue bonds. Close by, on a small island, is New York’s most famous landmark, the Statue Of Liberty. The head of Lady Liberty leads to the crown from which there are stunning views from several windows. New York City is most certainly unique. A city that’s very much alive and kicking, self-confident and always a surprise!